Last week we celebrated my 1 year anniversary of living in the DR (a whole YEAR! whoa..) by having a very Dominican dinner of mofongo. What is mofongo, you ask? Its a very ugly food. See picture below. Imagine: a very dry clump of garlicky mashed potatoes, infused with pork rinds and yucca.. Yeah, its pretty gross. It is served with broth, because if you ate it plain I'm sure it would be too dry to go down your throat. 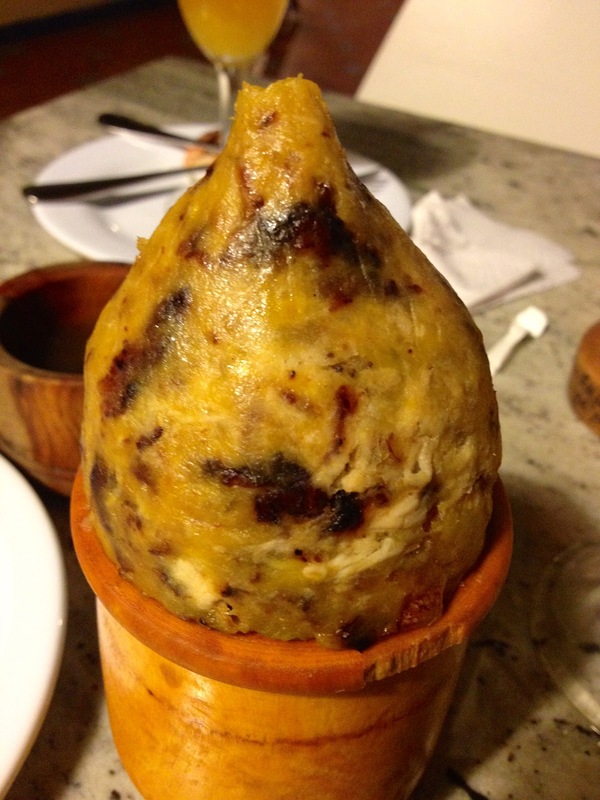 Its definitely not my cup of tea, but since many love mofongo I was curious to see if I would like it more after a year of living in the jungle DR. 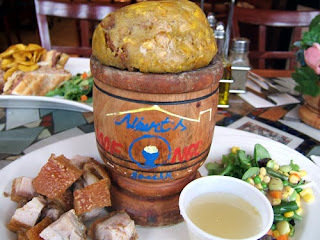 Instead of ordering the typical pork kind, I had the "mini mofongo" with platano maduro (sweet plantains) and chicken. Despite what it looks like, it turned out to be pretty delicious and went down like a piece of cake. Its definitely an acquired tasted, but a must try among Dominican foods. Happy anniversary to you doll! Yum, I'd love to try out Dominican cuisine! Bring it on! Have a lovely week kitten!